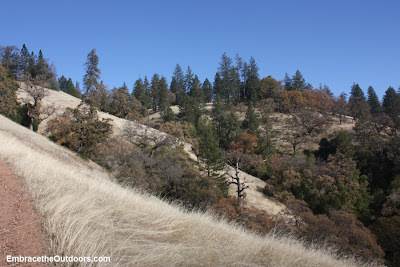 For our final hike of the year we headed to Diablo Foothills Regional Park in Walnut Creek. 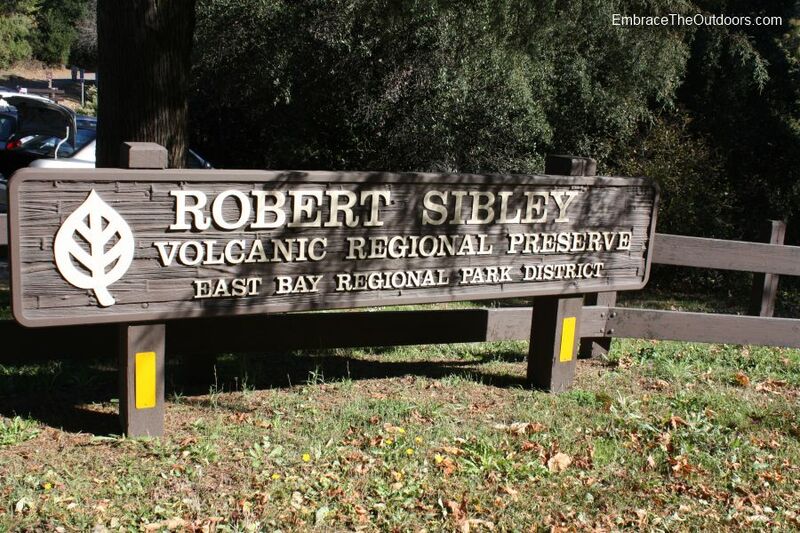 The parks 1,060 acres sit between Mt Diablo and the Shell Ridge Open Space. The park has two staging areas, Livorna Road on the south, and Castle Rock road on the north side. We went to the Castle Rock Trailhead. We started on the Castle Rock Trail right across the road from the parking lot. The morning fog had not yet lifted and the trail was very muddy. Early on there was a steep climb but it was short lived. We made a left onto Shell Ridge Loop Trail. Along this section the fog was so thick we barely noticed the cows grazing only a few feet away. We continued on Shell Ridge Trail and turned right onto Stage Road Trail. Next was a right onto Buckeye Ravine Trail, which was a narrow .4 mile single track and all uphill. 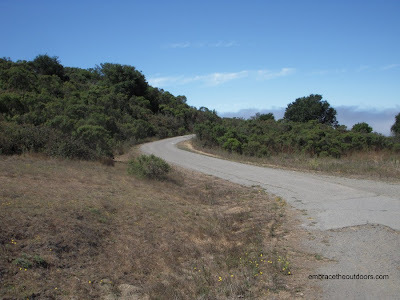 We then turned left onto Briones to Mt Diablo Trail. 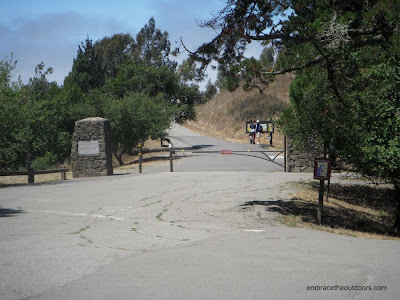 This trail leads straight to a gate which marks the border between Diablo Foothills and Mt Diablo State Park. 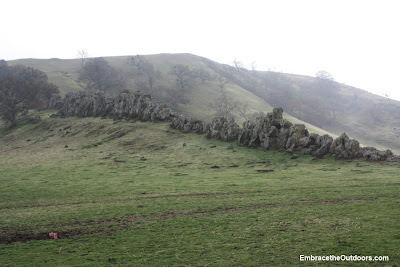 We crossed through the gate where you get your view of China Wall, a long rock outcropping. We hiked over to the wall itself near a pond and this would be our turn around point. 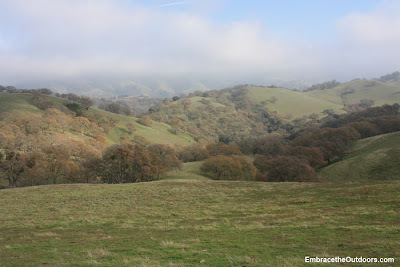 We retraced our steps back on the Briones to Mt. 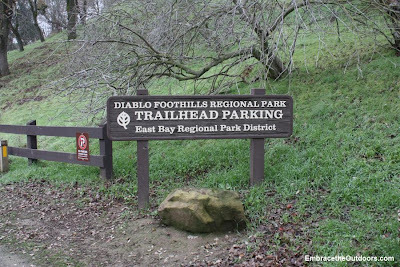 Diablo Trail. 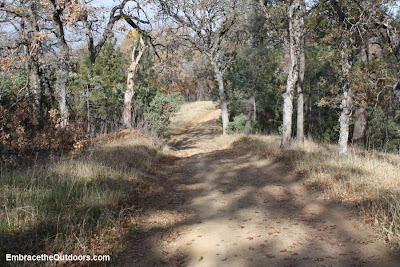 After passing Buckeye Ravine Trail we made a right on an unnamed trail to take us back to Shell Ridge Loop Trail. Making a left on Castle Rock Trail led us through Castle Rock Regional Recreation Area before ending at our car. 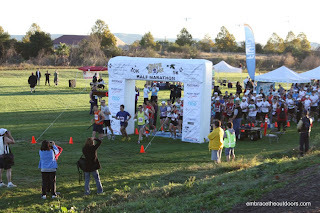 Castle Rock Regional Recreation Area has group picnic areas, basketball courts, softball fields and a swimming pool. Our hike totaled 6 miles with not much elevation change. It was a nice hike to do in cool weather since most of it was exposed. We passed several mountain bikers along the trails so we may go back and ride some time. 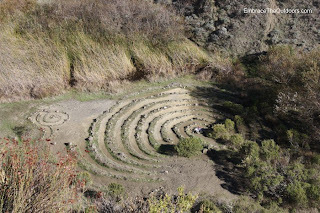 We decided to take advantage of the dry weather that is rare at this time of year and headed out for a hike to Henry Coe State Park. We've been meaning to do a hike at this park for some time and a cool December day seemed like a good time to do it. 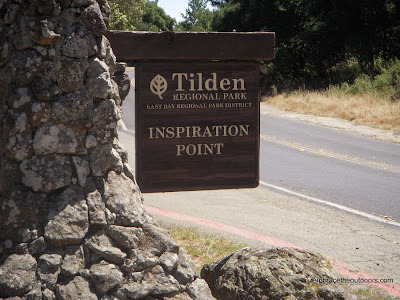 We headed to the Headquarters Entrance of the park which is a fairly straightforward 30 minute drive from Highway 101 with the last 10 miles through a narrow winding road. Once there we headed to the Visitor's Center to pay our fee and pick up our trail map. After gearing up and bundling up we made our way up the road to Monument Trail Head. 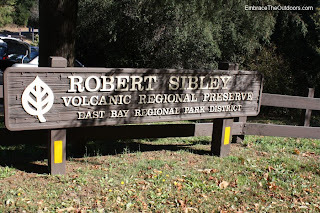 After climbing 400 feet we made a left at Hobbs Road, a wide fire road. We descended down about 600 feet and then took a junction to Frog Lake. We couldn't see or hear any frogs and the smell and several dead fish in the water kept us moving. 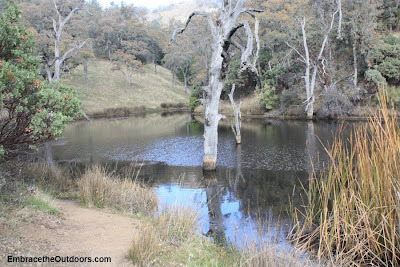 We retraced our steps until we reached Flat Frog Trail and headed down the narrow path. We hit a few patches of fog and some rare areas of sunlight on this fairly flat trail. 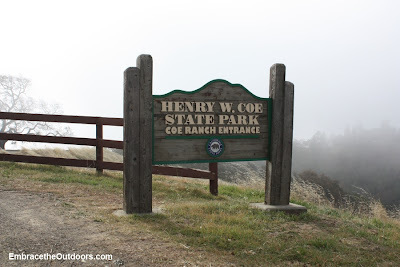 We caught some great views of the surrounding valleys when the fog allowed and there are a few areas with benches to rest and enjoy the view. We heard several birds and saw a few groups of quail scurrying across the path. Corral Trail led us back to the parking lot and our warm car. Although Frog Lake was a little disappointing, it was an enjoyable 4.5 mile hike. Henry Coe is a very large park, with several entrances. There is a huge amount of hiking and backpacking opportunities available to visitors. There is also a campground at the headquarters that has 20 drive-in sites that can be reserved. Here are a few of the things going on this month. Some last minute vacation days gave us the opportunity to go on a road trip. So we headed from our home in the Bay Area to Oregon. Day 1 was the drive up to Ashland, OR where we spent our first night. Ashland is home to the Oregon Shakespeare Festival. So we watched Don Quixote at the Outdoor Elizabethan Theatre. Day 2 had us drive to Crater Lake National Park. After a quick stop at the visitor center we headed to the rim to check out the view of Crater Lake. 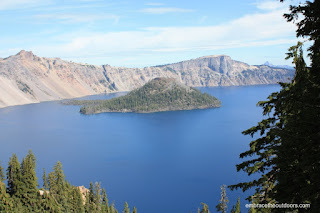 Crater lake is about 5 miles wide and famous for its blue color and clarity. All I can say is, "wow that water is really blue". After pictures at the rim we headed over to do the short hike to Watchman Tower. The hike is only about three-quarters of a mile up a modest grade. It ends at the top of the peak where the Watchman Lookout Station is located. Watchman is one of two fire lookout towers located in Crater Lake National Park. From here you get some great views directly over the lake. After the hike we jumped in the car and headed to the city of Bend. In Bend I will mention that we stayed at McMenamins. This unique hotel in downtown Bend was converted from an old schoolhouse to a lively destination hotel complete with classrooms-turned-lodging rooms, a pub, brewery and bakery, movie theater, and soaking pool. Day 3 had us going from Bend to Smith Rock State Park. 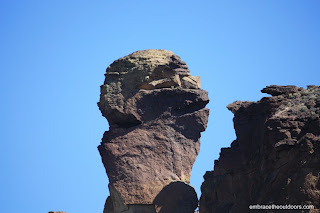 Smith Rock is most known for its fantastic rock climbing, but we went to hike to monkey face, a rock formation that looks just like a monkeys face. We chose to do the hike as a loop totaling 2.25miles. 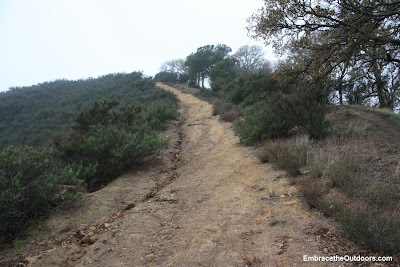 We started up the difficult climb and looped back on the easy trail. If you want to save some climbing you can take the easy trail out and back to monkey face, but you will miss out on some great views. 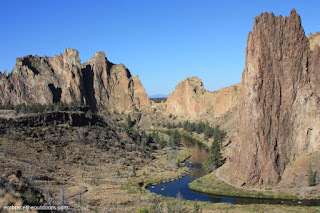 We left Smith Rock and headed towards Eugene where we would be spending the night. 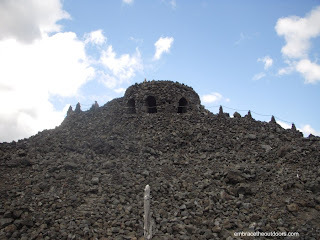 We took the McKenzie highway and came across the Dee Wright Observatory at the summit. The Observatory is located in the midst of a lava field and provides some fantastic views. From viewing windows inside you can see and identify several of the Cascade Mountain peaks. The Lava River Interpretive Trail is located next to the observatory, offering an unusual half-mile hike through young lava flows on a paved trail. 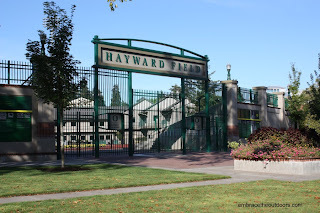 We started Day 4 in Eugene where we had to go check out Hayward Field, the historic track and field stadium. Then is was time to drive to Portland where we would spend two nights. We checked out Powells books, one of the largest bookstores anywhere and did some shopping around downtown. 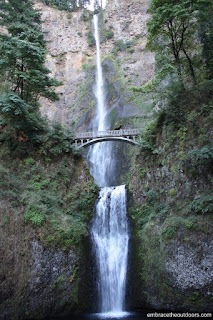 On our full day in Portland we headed out to see the Columbia River Gorge area. 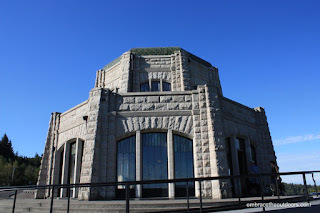 Our first stop on our scenic drive was the Vista house at Crown Point. This spot offers great views of the gorge and has a visitor center and gift shop. The volunteers here gave us a great map of the area and helped us plan the rest of our day. Next up was to check some waterfalls. 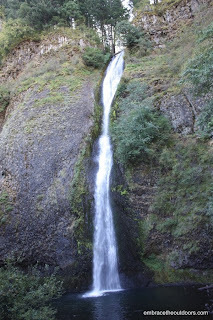 The area is well known for its numerous waterfalls, many of which can be seen right from the road. The most famous of them is Multnomah Falls, which is the second highest year-round waterfall in the United States at 620 ft. After visiting the last of the falls we drove on to visit Bonneville Dam. The dam has a visitor center and hatchery that were very interesting to visit. We concluded the day by making the drive all the way around Mt. Hood. 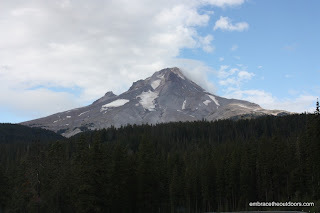 We did make a stop to visit the historic Timberline Lodge which sits near the summit. Day 6 had us saying goodbye to Portland and heading to the coast. 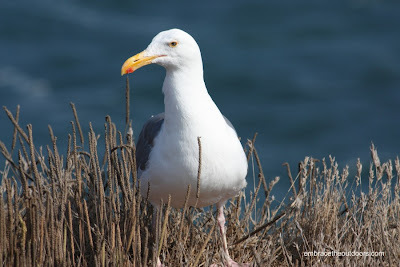 We checked out downtown Seaside before heading to Cannon Beach where we would stay the night. 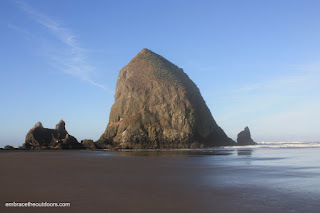 Our hotel was located right on the beach with a spectacular view of the ocean and the famous Haystack Rock. Day 7 had us driving south along the coast. 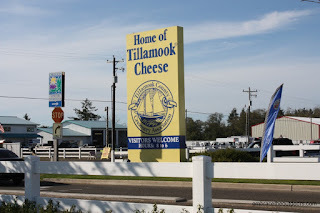 The best stop was at the Tillamook Cheese Factory. The factory gives you a chance to see the cheesemakers and packaging staff hard at work. You get free samples at the end of the quick tour. They have a store, restaurant and ice cream shop. The ice cream was amazingly good. 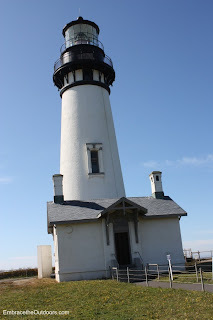 We also stopped at the Yaquina Head Lighthouse in Newport. Five dollar entry fee lets you check out the visitor center and walk up the stairs of the actual lighthouse to the very top. It was another great stop. We ended the night in Eureka. 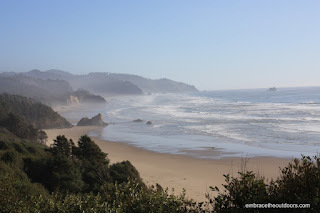 The final day we made quick stops to check out Fort Bragg and Mendocino before heading home. The trip overall was a lot of fun. The lack of a sales tax made shopping a little easier on the wallet. In Oregon its illegal to pump your own gas. So the full service gas station was weird at first but kind of a nice change. Certainly plan to visit Oregon again in the future. 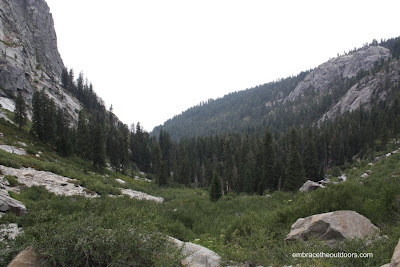 While camping in Sequoia we did a hike with the family to Tokopah Falls. The trail starts right by the bridge in the Lodgepole Campground, just a short walk from the campsite. The day was overcast, a nice break from the heat of late August. 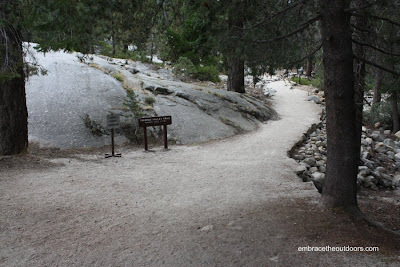 The trail was rocky at first but as the climb leveled the path was smoother. 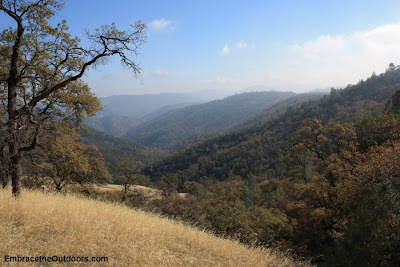 We followed the Kaweah River for a while then began moving away from it into the valley with great landscape around us. It got rockier and steeper as we got closer to the falls, with lots of loose rock. After 1.7 miles we reached Tokopah Falls which was really more of a trickle at this point in the summer. The granite walls around us were a spectacular sight and I could only imagine how beautiful this must be in early summer. 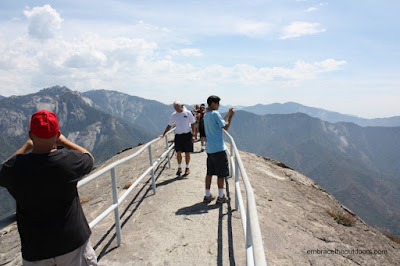 While camping at Sequoia National Park, we decided to check out Moro Rock. From the Lodgepole campground we took the main shuttle to the Giant Forest Museum, where you have to transfer to a smaller shuttle to get to Moro Rock. 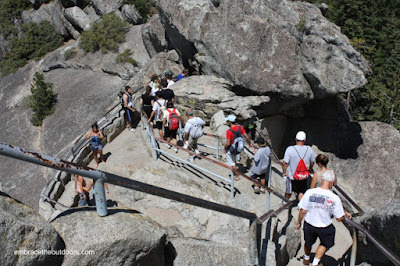 The road to Moro Rock from the museum is a very narrow 1.5miles, and there is very limited parking there for cars. So make it easy on yourself and take the shuttle. 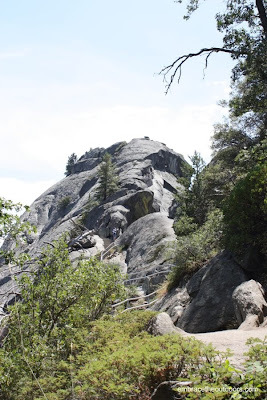 Moro Rock is a granite dome which tops out at an elevation of 6,725ft. The trail to the top is only .25miles but you climb up nearly 400 steps. Most of the trail has railing for safety. 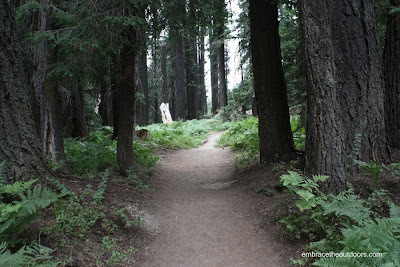 On our particular day the trail was packed with what seemed like a constant stream of people. The pay off is an amazing 360 degree view from the top. 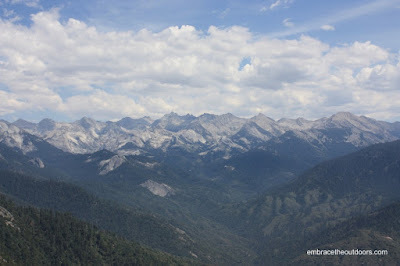 We are back from 3 nights camping at the Lodgepole Campground in Sequoia National Park. Lodgepole, and all of Sequoia can be reached from either Fresno via Highway 180 or from Visalia via Highway 198. If your driving an RV, beware that there is a 16 mile section if coming from Visalia that the maximum vehicle length is 22 feet, so you should enter the park from Highway 180. Lodgepole campground has around 200 campsites for RV's or tents. Each campsite has a picnic table and fire ring, with flush toilets nearby. The campground is large and spread out. The 151-214 loop seemed very crowded to us. We were staying in the 1-22 loop, in which the campsites were more spread out, but it was mostly RV's in the loop. Sites 69-144 are tent only and there are a few really nice sites right along the river. Despite the size of the campground it was amazingly quiet most of the time. And I admit I loved being able to run over to the market and grab some ice cream for dessert. Right next to the campground is the Lodgepole visitor center and market for last minute groceries and gifts. In the same building as the market there is a snack bar with pizza and hot dogs, and a deli that also sold ice cream, a laundromat and the showers. Showers are coin-op and require $3 which gets you 10 minutes. Showers are open 8am to 8pm, but are closed from 1pm to 3pm for cleaning. We usually headed to the showers around 4pm and there was a line every time. There is a nature center in the middle of the campground. 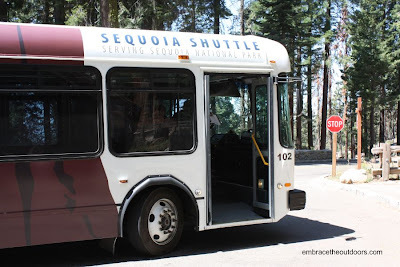 From there or the front of the visitor center you can jump on the Sequoia Shuttle. 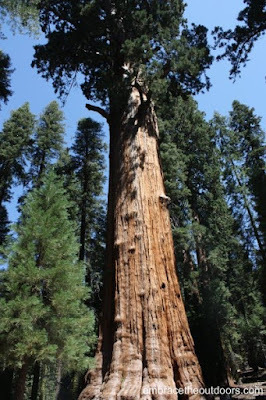 The Shuttle takes you to the Sherman Tree, Wuksachi Lodge and Giant Forest Museum. 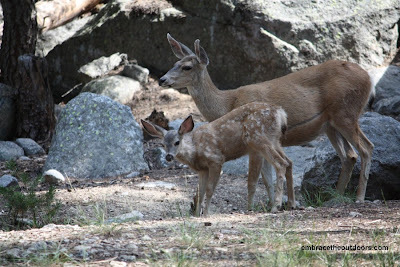 At the museum you can transfer to a smaller shuttle and visit Moro Rock and Crescent Meadow. Down by the bridge inside the campground is a trailhead that leads into the Sequoia backcountry and the trailhead for Tokopah Falls. 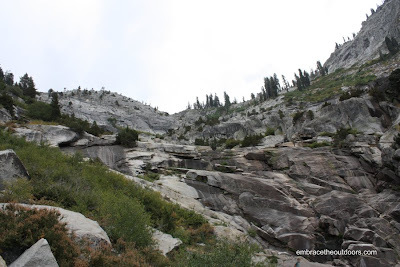 Tokopah Falls is 1.7mile hike from the campground. Unfortunetly at this time a year the falls was more of a trickle. But there was still just enough water under the bridge in the campground to hop in to cool off. We just got back from 2 nights of camping at New Brighton State Beach. 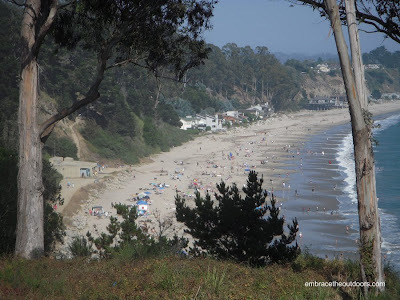 New Brighton is located in Capitola just south of Santa Cruz. Just take the New Brighton/Park Ave exit off of Highway 1. New Brighton is located atop a bluff right on the coast. There is a path that you walk down to reach the beach. The campground has 111 developed campsites for tents or RV's up to 36' in length. Ten of the campsites have partial hookups. And a different nine campsites are considered premium campsites. The premium sites are located along the edge of the bluff, these have a view of the ocean and the shortest walk to the beach. The premiums have an added fee to them. All the sites have the standard picnic table and fire ring. Flush toilets and coin-op showers in each loop, 25cents get you 2 minutes. Some sites are limited on shade. We really liked New Brighton. Its a nice clean campground right next to the beach. Will probably return next summer. 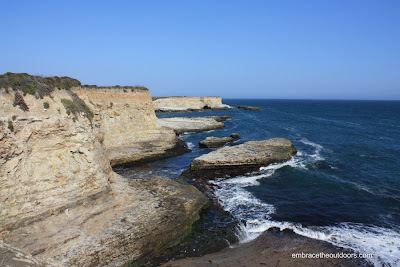 We also enjoyed how close it is to Capitola and Santa Cruz. On Saturday we actually grabbed our bikes and headed out. First stop was Capitola where we parked the bikes and checked out all the little shops. We then biked to downtown Santa Cruz, where we strolled around some of the stores and checked out an art festival they were having. We then headed down to the Santa Cruz Beach Boardwalk. The boardwalk hasn't changed much over the years and was extremely crowded. After eating at the Boardwalk we headed back to the campground. 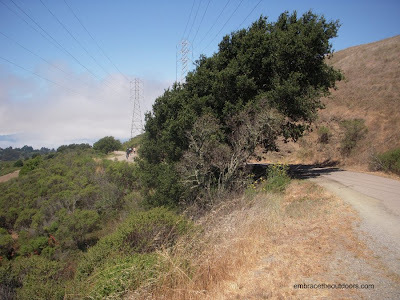 The Santa Cruz area is very bike friendly, with bike lanes or bike paths everywhere. New Brighton Beach. Trail on the left of pic leads up to the campground. Wilder Ranch State Park comprises 7,000 acres in Santa Cruz. 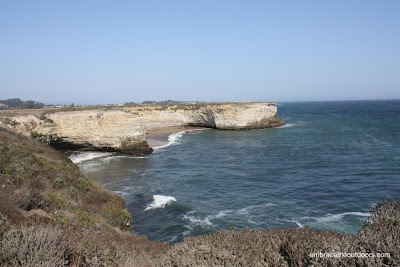 From Santa Cruz, go north on Highway 1 and turn left about a mile past Western Dr. The park has 34 miles of hiking, biking and equestrian trails. There is an interpretive center and park store. There is a fee for day use. 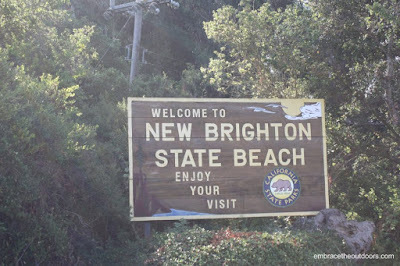 If your camping at New Brighton which is nearby, the entrance fee is waived. Wilder is apparently very popular with mountain bikers, but on our visit we came to hike. We parked in the main lot past the entrance and took Old Cove Landing Trail towards the ocean. The trail travels along the top of the bluff following the coastline. The views of the ocean and the cliffs were amazing. The trail goes about 1.7 miles. 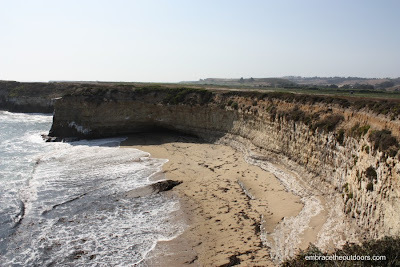 You can then continue on the Ohlone Bluff trail all the way to 4 mile beach. Thanks to some free time today I headed over to Coyote Hills Regional Park in Fremont. Coyote Hills is part of the East Bay Regional Park District. 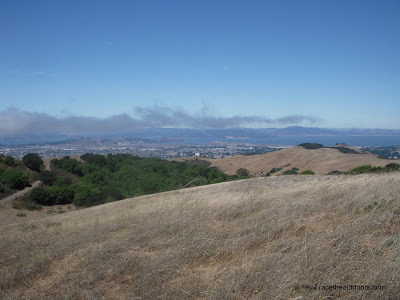 It is 978 acres of marshland and grass covered hills along the bay in Fremont. Its located on Patterson Ranch Road off of Paseo Padre Parkway. There's only a small brown sign to let you know its there. They have a visitor center, restrooms and picnic tables. There is a $5 entry fee. This is a park that I used to visit often, but must admit I have not been here at all in the last several years. I don't recommend it as a place to go hiking, but for going for a walk. Or as I did on this particular day, its a nice place to go for a bike ride. I rode 2 loops of the Bayview Trail. 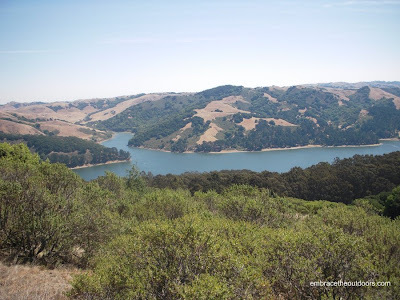 The Bayview Trail is a 3.5mile paved, easy loop around the hills starting right at the visitor center trailhead. This gives you some great views of the bay as you ride along. The major downsides of the park is that it gets extremely windy here, and sometimes you get some funky smells coming in off the bay. I hoped to post a bunch of pictures but I forgot my camera, and my cellphones camera wasn't up to the task. 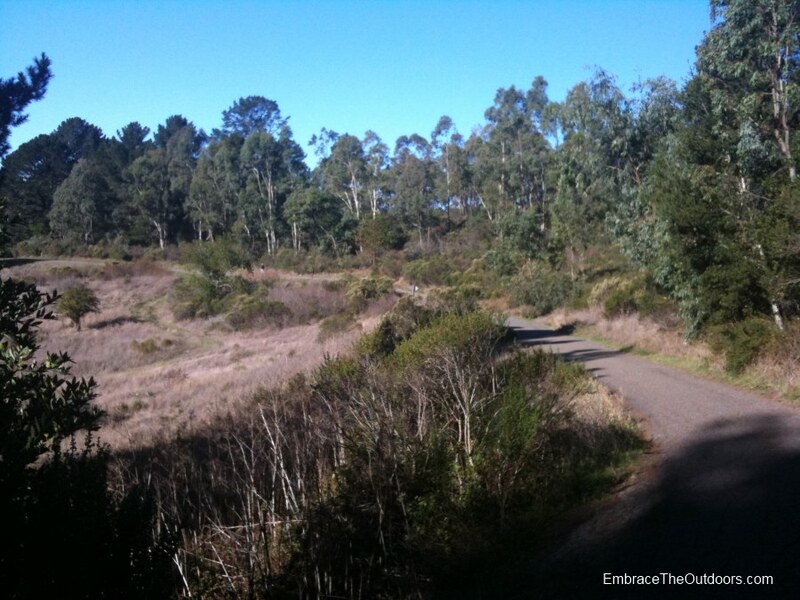 My plan is to return soon to ride the Alameda Creek Trail which connects to Coyote Hills.